Of this plant there are several kinds, as MOUSE-EAR HAWK-WEED, Hieracium Dubium; and LUNG-WORT HAWK-WEED, Hieracium Pulmonarium, but their virtues are the same. 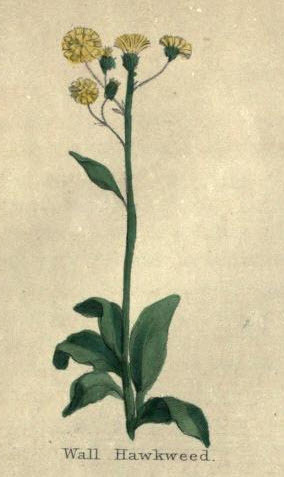 It has many large leaves lying upon the ground, much rent and torn on the sides into gashes like Dandelion, but with greater parts, more like the smooth Sow Thistle, from among which rises a hollow rough stalk, two or three feet high, branched from the middle upward, whereon are set at every joint longer leaves, little or nothing rent or cut, bearing on their top beautiful pale yellow flowers, consisting of many small, narrow leaves, broad pointed and nicked at the ends, set in a double row or more, the outer�most being larger than the inner, which turn into down, and with the small brownish seed is blown away with the wind. The root is long, and rather large, with many small fibres thereat. The whole plant is full of bitter milk. It grows in many places about the field-sides, and the path-ways in dry grounds. It is now cultivated in gardens. Hawk-weed is cooling, drying andbinding, and therefore good for the heat of the stomach, and gnawings therein; for inflammations, and the hot fits of agues. The juice in wine, promotes digestion, expels wind, and neutralizes acidity in the stomach. A scruple of the dried root given in wine and vinegar, is good for the dropsy. The decoction taken with honey, and with hyssop, promotes expectoration and allays cough. The decoction with a little wild succoury, made with wine, relieves colic, and hardness of the spleen it procures rest and sleep, purges the stomach, increases and purifies the blood. It is also good for bleeding piles, and the leaves boiled in milk may be applied outwardly. In many parts of Europe it is a constant medicine in diseases of the lungs, asthma, and incipient consumption. The juice mixed with milk is good for inflamed eyes. The green leaves bruised and mixed with salt make a good ointment for burns, erysipelas, and inflamed parts.